This site applies to the entire chapter. 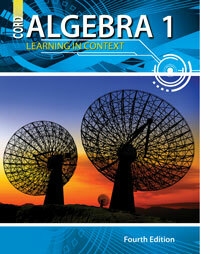 This site contains an overview of systems of linear equations along with step-by-step examples. This series of pages introduces the plotting of ordered pairs on the four quadrants of the Cartesian coordinate system. A Flash video tutorial about lines and linear equations. This page has a detailed definition on the slope of a line. This site contains an explanation of the slope of a line and how to calculate it. Online solver to calculate slope given two points. This site has gizmos that show different parts to graphing linear equations. This site has the steps on how to graph linear equations with graphs to demonstrate. This page contains practice problems on writing linear equations when looking at a graph and when looking at a pair of points. This page gives practice writing and interpreting a linear equation based on a real life situation. This site discusses and provides practice for finding the intercepts of a linear equation. This site discusses and provides practice for finding the equation of a line from two points. This site explains the slopes of parallel and perpendicular lines with practice problems. This page defines the slopes of parallel and perpendicular lines and contains examples. This page contains notes and a graph explains scatter plots. This site defines scatter plots and lines of best fit and has interactive graph applets on which to plot points. This page explains how to graph linear inequalities with two variables.